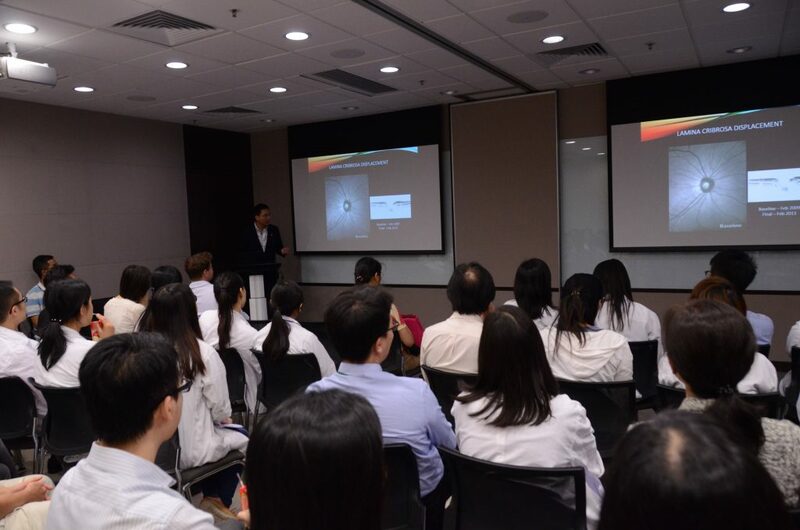 The Grand Round, jointly organized by DOVS CUHK, the Kowloon Central Cluster Ophthalmology Service (Hong Kong Eye Hospital and Queen Elizabeth Hospital), and the New Territories East Cluster Ophthalmology Service (Prince of Wales Hospital and Alice Ho Miu Ling Nethersole Hospital), is a subspecialty-based training and educational program in clinical ophthalmology and visual sciences. The Grand Round is a Continuous Medical Education (CME) activity accredited by the College of Ophthalmologists of Hong Kong. The weekly Thursday evening Grand Round is to provide a citywide platform for educational activities which serve to maintain, develop, or increase the knowledge, skills, and professional performance and relationships that ophthalmologists and eye-care professionals are required to provide and enhance services for patients, the public, or the profession. Experts in ophthalmology, visual sciences and other related disciplines from all over the world are invited to speak in the Grand Round, in addition to our faculty members and subspecialty teams of the two clusters. The Grand Round is also broadcasted live to JSIEC in Shantou while online archive is available to JSIEC, ten Lifeline Express Microsurgical Training Centers throughout China and Grand Round Video Website. Hosted by the Asia-Pacific Academy of Ophthalmology (APAO), and co-hosted by DOVS CUHK, the Zhongshan Ophthalmic Center and State Key Laboratory of Ophthalmology of the Sun Yat-Sen University, the APAO Grand Grounds Around the World target to provide a real-time web-conferencing platform for ophthalmologists and visual scientists in the Asia-Pacific region to share clinical experience and expertise, as well as the latest research findings and implications. Hypertension - What, why and how? Our previous lectures in 2019 can be found at here. Our previous lectures in 2018 can be found at here. Our lectures before 2018 can be found at here.